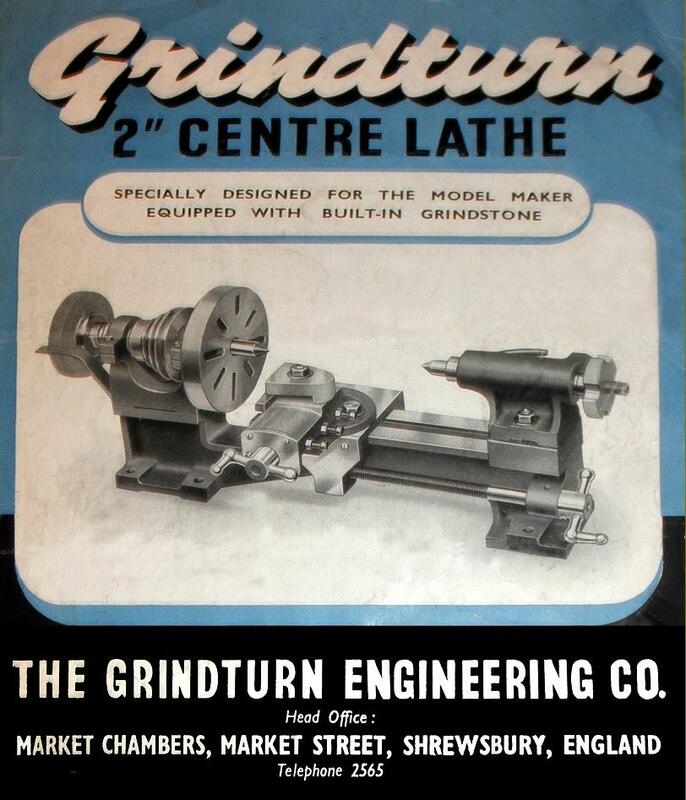 Manufactured first by John and Henry Yardley, who traded as Grindturn Engineering from premises in Market Chambers, Market Street, Shrewsbury, it is believed that the Grindturn was in production by 1947 as a 2-inch centre height lathe that took 8 inches between centres. The name Grind-turn came from the (ill-advised) fitting of a small grinding wheel on the left-hand end of the headstock spindle - grinding dust and lathe beds tending not to mix. Details of the Company's early days are sketchy but the possibility exists that demand was such that manufacture was partially sub-contracted to Richard Haighton Ltd. of the Vulcan Works in Nelson, Lancashire. By late 1948 the capacity had been increased by one-half inch on centre height (the between-centres remained the same) and a second version offered that was mounted on a cast-aluminium base plate complete with a 0.25 h.p. motor and a particularly neat, 6-speed all-V-belt countershaft. It is possible, though not confirmed, that the original 2-inch Grindturn can be recognised by its overhung leadscrew, the 2.5-inch version having a supporting bearing at the left-hand end. 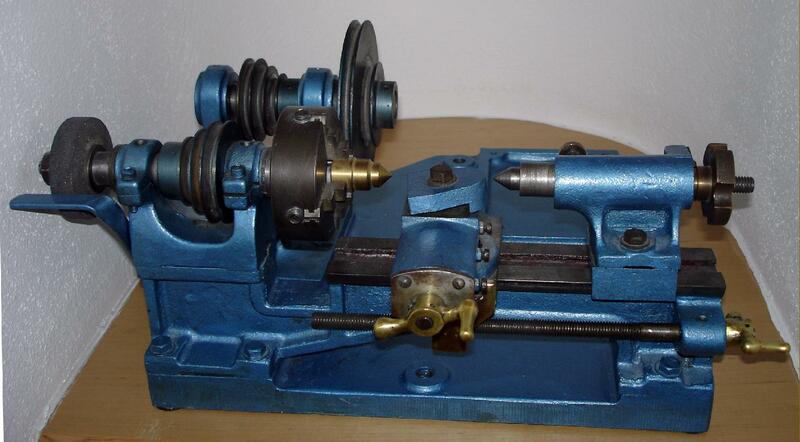 In January, 1949, the basic lathe was listed at £12 : 17s : 6d and that on the base a stiff £25 : 15s : 0d. - though as the whole assembly was light enough to be considered portable and able, with "suitable permissions", be moved indoors during winter months to share the kitchen table and warmth from the open coal fire it would had considerable appeal to the better paid. Unfortunately, by the middle of 1949, prices had increased by over 13%, taking the base-mounted unit to £32 and the ordinary model to £15 : 15s : 0d. 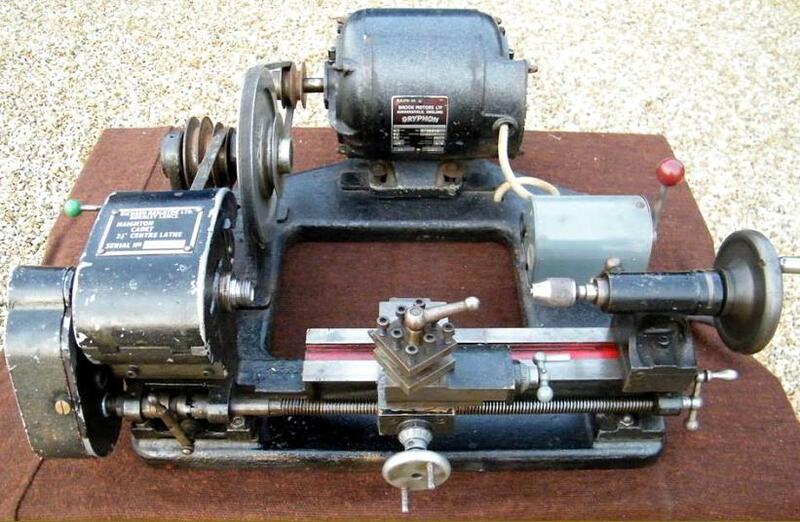 By 1949 the Grindturn company was bankrupt and Haighton took the opportunity to acquire the manufacturing rights and set about producing an improved version - in a letter dated June, 1950, Haighton mentioned introducing a screwcutting version of the lathe (with a rather flimsily dog-clutch on the leadscrew), and this machine was advertised both as the "Haighton Grindturn" and "Haighton Cadet". Although the leadscrew on this model ran through a solid bronze nut, unlike the majority of other makers who employed this design, on the Haighton the nut was split along one side and could be adjusted for wear by a pair of socket-headed screws. 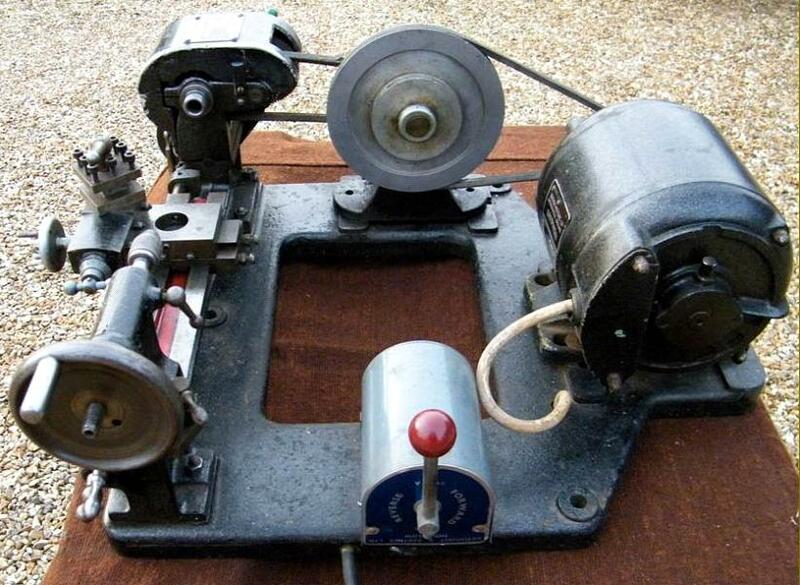 Possibly coinciding with the Company's move to Burnley in 1954, the Grindturn reference was dropped from advertisements and only the description "Cadet" employed; An obvious development of the original machine, the "Cadet" was very well built, almost a large lathe in miniature, with an outstanding specification and very careful attention to detail. The bed, held down with four bolts at the headstock end and two at the tailstock, was fitted to a slightly modified and rather better-finished aluminium baseplate with rounded edges (later models changed to a superior cast-iron plate, the increased rigidity of which played a large part in the lathe's ability to take surprisingly deep cuts while maintaining accuracy). 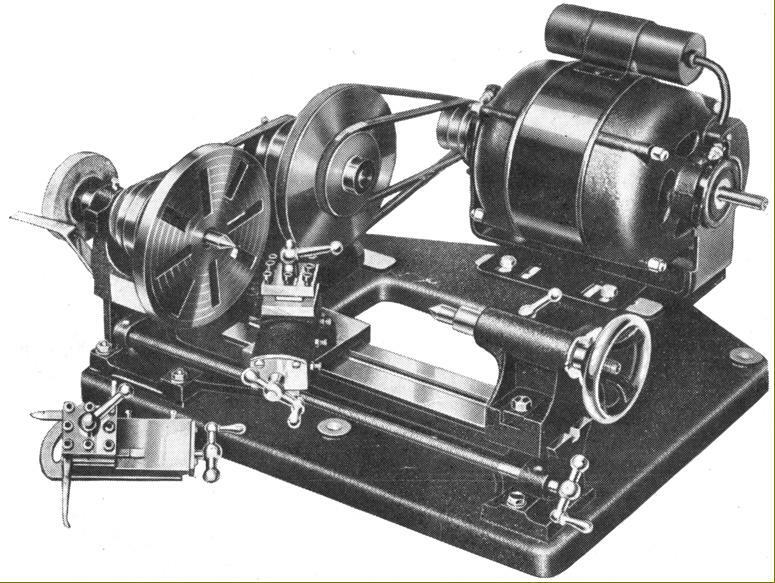 Other improvements and options included a dog clutch with better support and a spindle backgear together with belt and changewheel guards (although a version of the original Grindturn was offered with changewheel drive to the carriage, the lack of backgear for slow speeds meant this was only suitable to produce a power feed along the bed, screwcutting requiring the spindle to be turned by a hand). As a reflection of its quality and comprehensive specification, the price of a complete, motorised the Cadet in the mid 1950s was £44 : 15s : 0d, only £7 : 2s : 6d less (25%) than asked for the 3.5" x 20" Myford ML7. However, despite the steep price, in 1953 Haighton were able to run a series of advertisements in Model Engineer Magazine proclaiming: Now over 500 satisfied users. Assuming this to be accurate, it was a reasonable achievement, meaning sales averaging three per week and bringing in a steady if unspectacular income for the company. Eventually, manufacture was taken over by one Mr. Douglas Guest, the former general manager of Haighton's engineering department, who had left to start his own company, D. Guest Ltd. Guest's later merged with Cleveland Engineering Ltd. (lathes made in post Haighton times can be identified by the use of die-cast micrometer dials in Zamak with crude divisions that lacked digits). The new organisation, Cleveland-Guest, grew to occupy four sites in Colne - North Valley Road, Greenfield Road, Keighley Road and Colne Lane - and is now part of Gardner Aerospace. It is likely that production of the Cadet would have finished during 1958, coinciding with the cessation of advertising in the model engineering press. 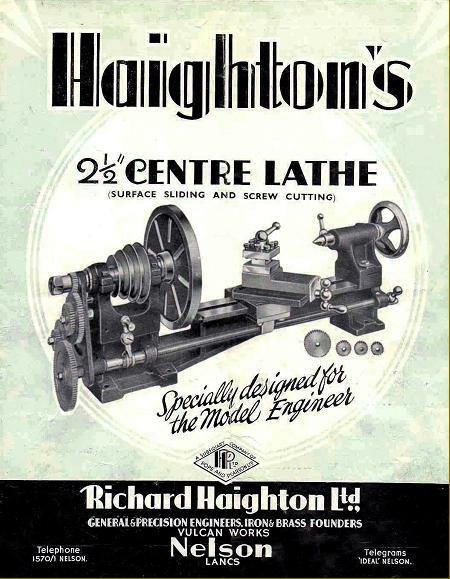 Haighton were not just makers of a small lathe, but a proper engineering company with a long history of successful projects. One interesting machine, constructed from approximately 1953 to 1958, was the "Major", a development of the beautiful American Hardinge TM/UM precision universal milling machine. Haighton must also have enjoyed some influence with the local technical college (and the teachers a degree of common sense) for, in the 4th & 5th year of their City and Guilds Machine Shop Engineering Course, students had to build a 'Cadet' from castings and parts supplied by Haighton. Flat-topped, the V-edged bed had a usefully large gap (to accommodate a 6-inch faceplate able to hold work up to 7" in diameter) with the carriage propelled along it by an overhung leadscrew turned by an ungraduated handwheel. A proper backgear assembly and full screwcutting were both supplied as part of the standard specification and the 3/4" x 12 t.p.i. spindle fitted with a No. 1 Morse taper nose - where an inadequate No. 0 might have been expected. Simple, split bronze bearings were used and 12 speeds provided (including backgear) from 25 to 1800 rpm. As before, the 6-speed countershaft assembly was bolted to the frame and used proper (if miniature) 3/8" (8 mm) V-belts to transmit power from the full-size (and hence heavy and reliable) Brook Gryphon single-phase motor (today these belts, if unavailable, are easily replaced by 8 mm round ones, heat-welded to the right length). In place of tumble reverse (which is difficult to engineer satisfactorily on small lathes) a dog clutch was fitted to the headstock-end of the 0.5-inch diameter, Acme-form leadscrew. Because the leadscrew nut was "full", and could not be disengaged from the carriage (though it could, as mentioned before, be adjusted for wear), the clutch was an essential fitting - and also eliminated the chance of making errors when re-engaging the drive during screwcutting. 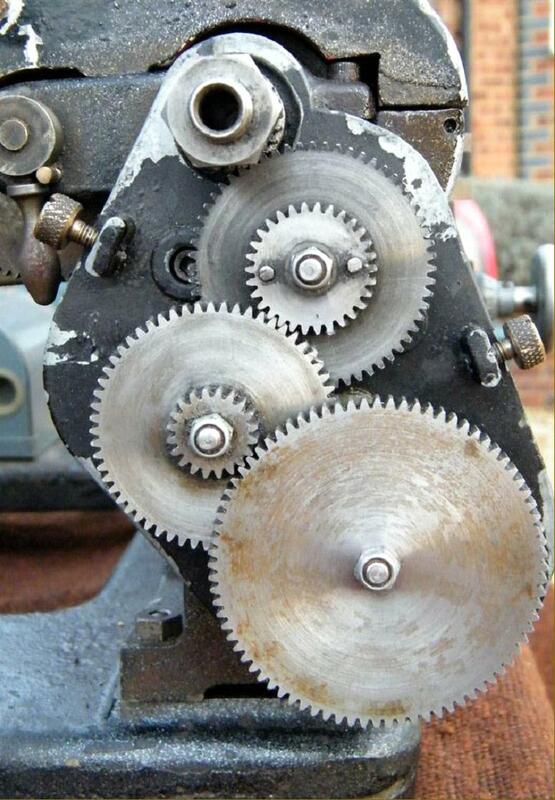 Of 30 DP with a 14.5° pressure angle and a 1/4" hole, the changewheels were arranged in a rather unusual way with, driven from the spindle-mounted gear, a pairs of gears on a fixed stud (only pre-set clusters, permanently riveted together, could be used) - a situation that made selection of gear sets awkward. The drive then passed to the usual train of gears carried, in this case, on pins secured to a plate that did duty both as a swing bracket and as a mounting point for the gear guard. 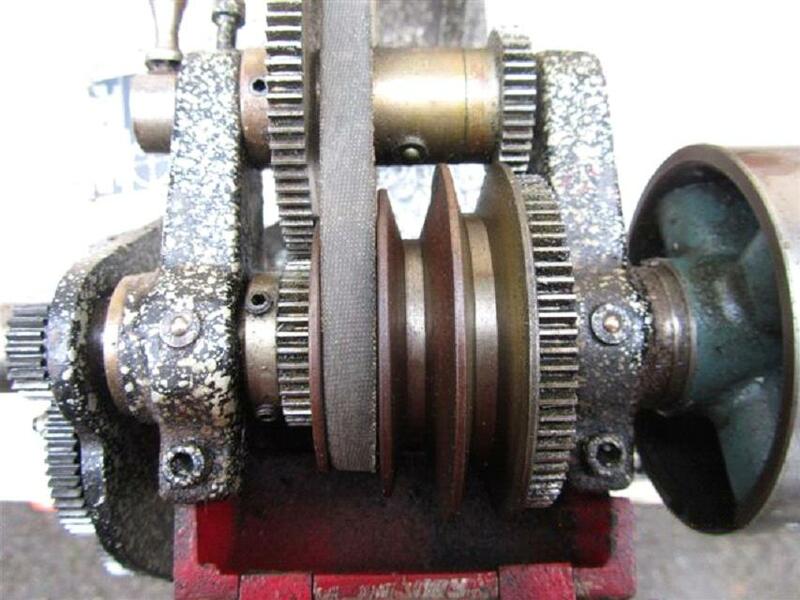 Although not confirmed, it would appear that the lathe was supplied with a set of changewheels only sufficient to provide a single rate of fine feed, the standard arrangement being: 24t/60t, 30/60 and 20/80 to give a 20 : 1 reduction and a feed rate of 0.005 per rev. 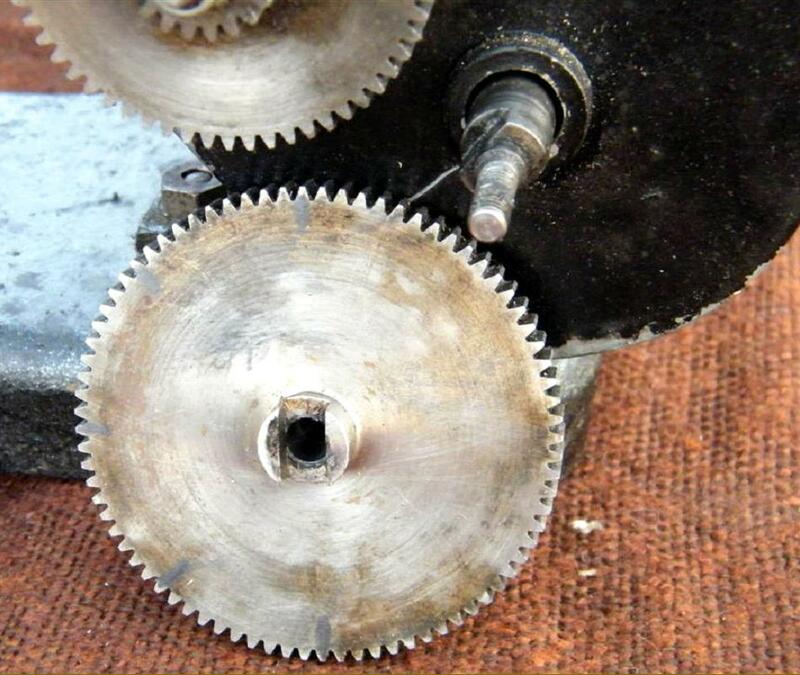 As every change of pitch required a different gear on the end of the leadscrew, the owner was faced with the expense (if a full screwcutting range was needed) of buying an extra 15 gears. The situation was not improved by the design of the leadscrew end - its machined boss required every gear to have a matching section on its rear face..
On the Grindturn and early versions by Haighton (as the "Haighton Grindturn") only a single, swivelling top slide had been fitted (though with a 4-way toolpost as standard), but Haighton then improved matters considerably by including a proper and very well made compound slide assembly. Although the top slide could be swivelled through 360°, and fixed in one of two positions on the cross slide (each location complete with degree marks) the makers did not, oddly, think fit to include a T-slotted cross slide - nor to offer one as an extra. However, they did eventually list a beautiful swivelling milling slide, an item so rare that the writer has only ever seen one example. Another Haighton enhancement was the fitting of clearly engraved, zeroing micrometer dials to the 1/4" x 26 t.p.i. (standard BSF specification) feedscrews (the Grindturn had had non), proper "balanced" handles in steel and an end plate in bronze. In later years the rather fine spoked tailstock handwheel was replaced by a plain, full-circle type--though this may have occurred simultaneously with the change to Zamak micrometer dials when manufacture passed into the hand of Cleveland Guest. A 4-way toolpost continued to be included as part of the standard equipment (a special and expensive quick-set tool holder from Burnerd was also available) along with full enclosure for the changewheels - and a semi enclosure for the headstock drive belt. Of remarkable weight and strength, the No. 1 Morse taper tailstock could be set over for the turning of slight tapers and had an unusually large handwheel - the latter an item often neglected on miniature lathes. Although described as, "Completely self-contained and portable" the large base-plate and full-size electric motor meant that the all-up weight (even with the aluminium support) approached 42 lbs and it was certainly not as easy as the makers claimed to: "Turn your kitchen table into a workshop". When fitted to the 70 lb cast-iron base it became even harder to move, especially when the large Gryphon motor was included. Doubtless Er in do'u'ers (or, as our much more perceptive American friends would say, SWMBO) would also have had a thing or two to say about the matter, especially if asked to help carry it back to its storage in't' 'cole'ole. Four different paint finishes have been identified: early models seem to have been painted in either a very ordinary plain grey or, as an attractive contrast, in a remarkable "splatter"" silver-on-black finish not unlike the "Craquelle" applied to the quite different German Hommel. Even later some models were finished in crackle-black (a coating used until the 1950s to indicate mechanical items of better-than-usual quality) or black with a silver-flake effect. The rather unusual "splatter" finish was achieved by using a carefully adjusted, low-pressure spray gun filled with very thin paint. 'Craquelle' was produced by using a second paint layer over a not-quite-dry base, the top layer drying faster and so cracking as it slid over the lower layer (a finish that is, apparently, difficult to get right mail@spaeth-schwarz.de). One example of the Cadet that the writer found several years ago was still resplendent in its original "crackle-black paint (which had lasted remarkably well) and ran almost silently, with the heavy bed plate adding such enormous stiffness that it was, as a consequence, capable of taking extraordinarily heavy cuts for so small a machine. If you find a Grindturn or Cadet don't be tempted to take it off the mounting foot, the lathe really will work much better in its original form..
A late-model Haighton Cadet made by Cleveland Guest. These examples can be identified by their cheap, die-cast micrometer dials. 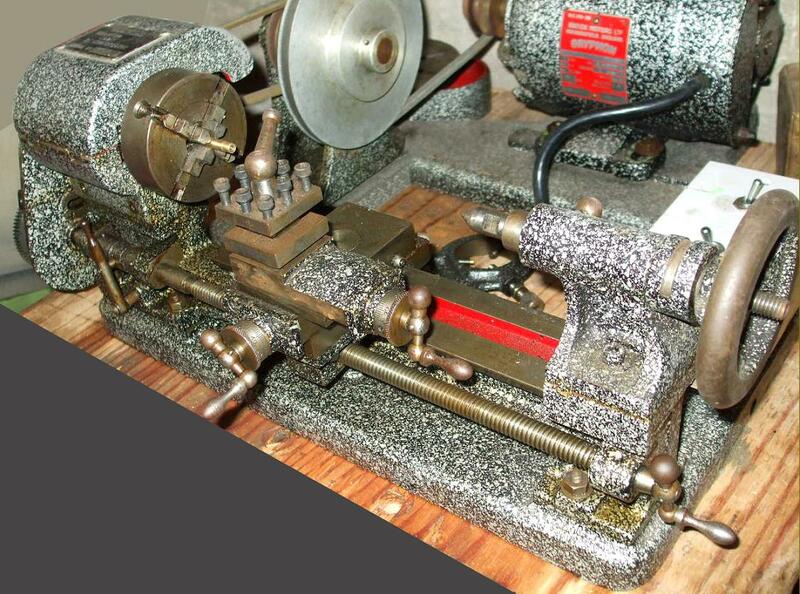 This lathe was painted in yet another strange finish: black with a silver-fleck effect. A completely original Cadet - even to the full-size electric motor and Dewhurst reversing switch. The latter was fitted by the factory and the wiring properly shielded. Of 30 D.P. the changewheels were arranged in a rather unusual way with, picking up from the headstock-mounted gear, a pair of gears riveted together on a fixed stud (only pre-set clusters could be used, a situation that made selection of gear sets awkward. The drive then passed to the usual train of gears carried, in this case, on studs secured to a plate that did duty both as a swing bracket and a mounting point for the gear guard. The silver flecks in the black paint finish can just be made out. A proper 3/8" miniature V belt and strongly-supported backgears on the Haighton Cadet. Heavy cast-aluminium inner and out covers guarded the changewheels and headstock drive belt. The leadscrew was fitted, as standard, with a neat dog-clutch.